You Guys! I would love for you to follow me on Pinterest and Instagram! I am stoked to share my X Arbor with Bench today!! It just makes me smile! 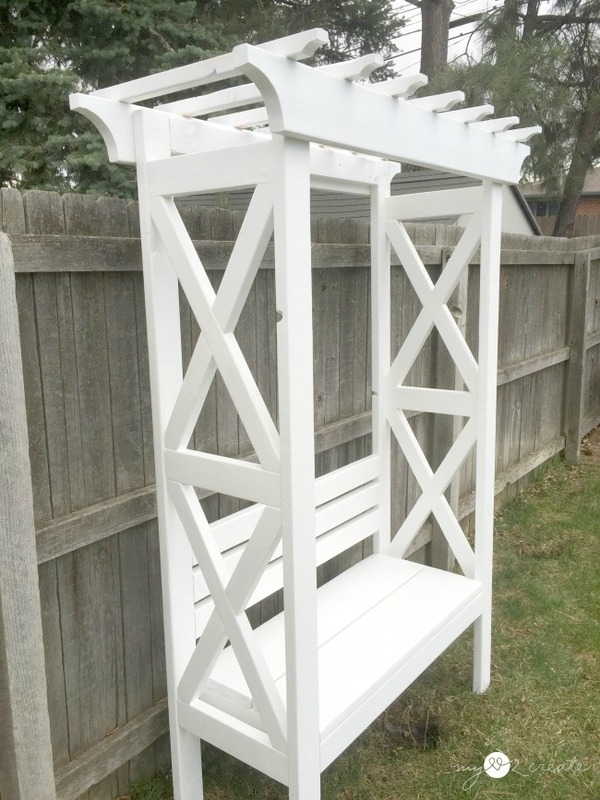 I have always loved arbors so it kind of makes me giddy that I finally built one! And I also love X patterns, you know my floating night stands and rustic industrial kid chairs, so naturally I had to use it in my plan. :) I am so happy I did! 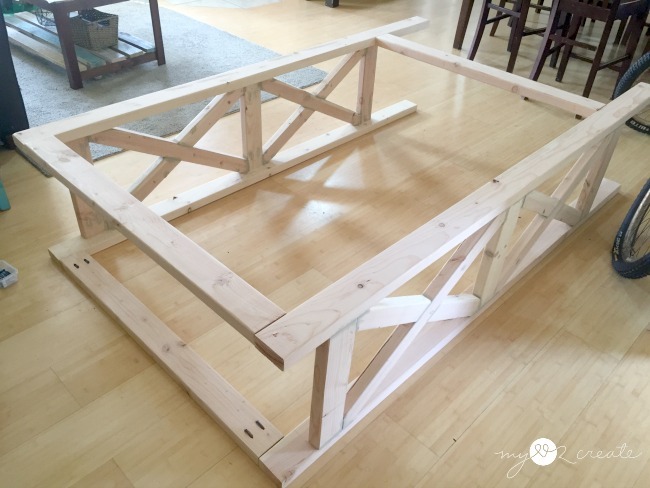 I am so thrilled to team up with Build Something to bring you the plans, they have an awesome site for free building plans and you can even upload your own. It is such great community! 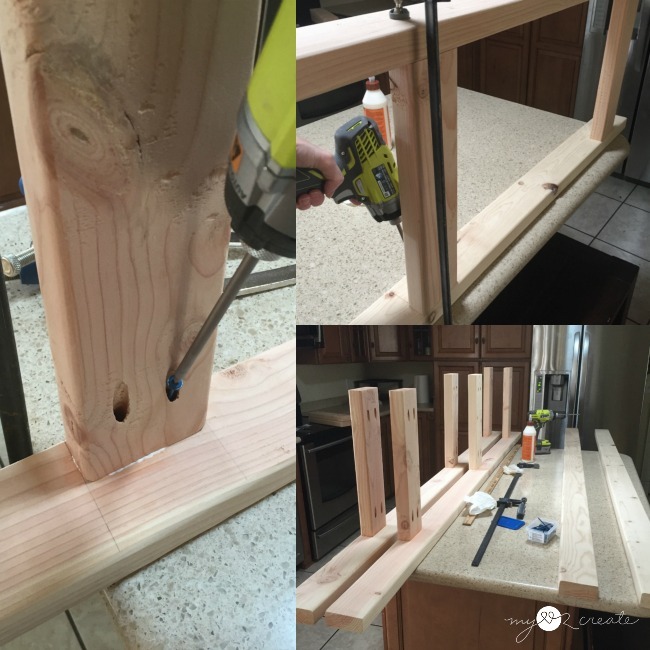 I started by cutting all my wood, drilling pocket holes and using my jigsaw for the rafter boards. I love seeing the wood all stacked ready for building. I stared by building sides. I marked where the rails needed to be and then attached them to the legs. 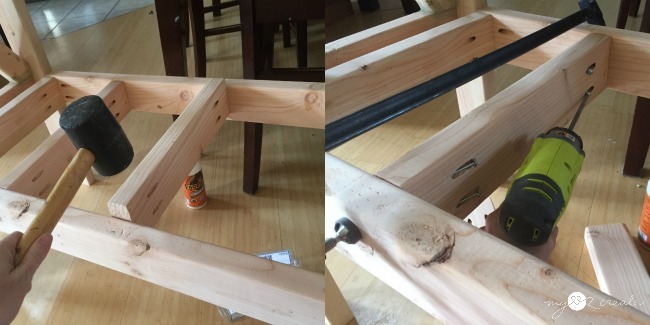 I cut the angles on my x pieces and then drilled a pocket hole in each end for attaching it to the side. 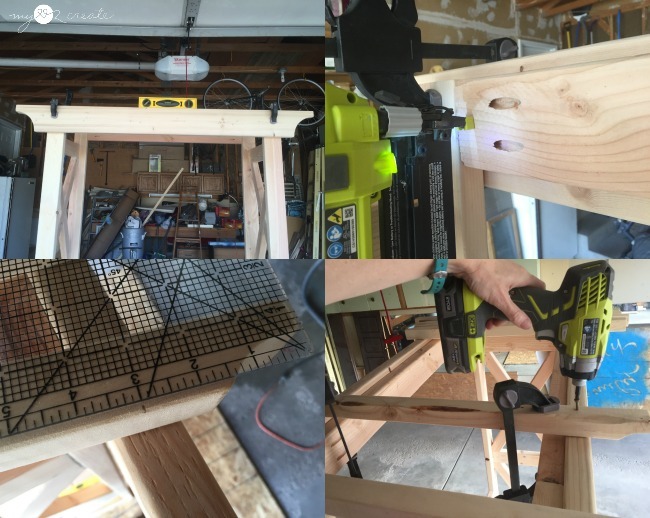 I love my Kreg K5 Pocket-Hole Jig (affiliate link) and how you can drill pocket holes at such steep angles. Here are my x pieces ready to be put into the sides. 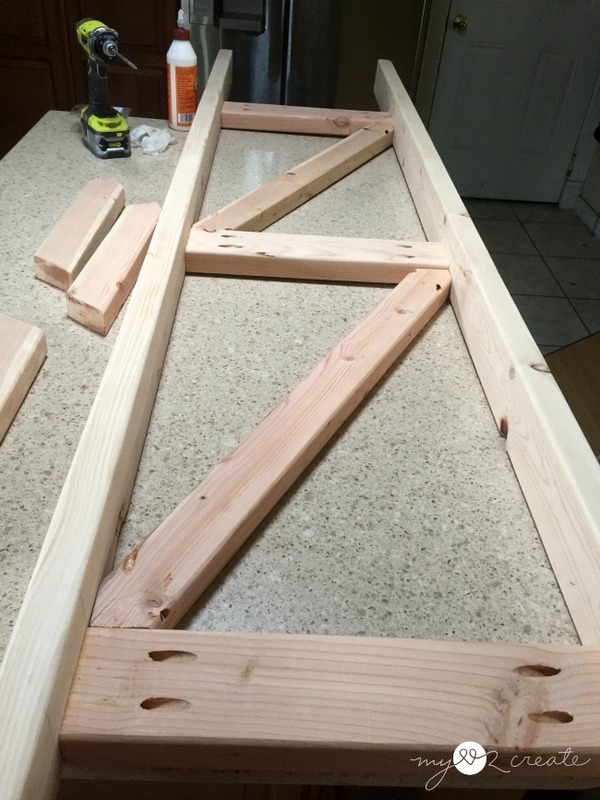 First I attached the long x pieces with glue and 2 1/2'' screws. And then added the top! Looking good! I did this for both sides. 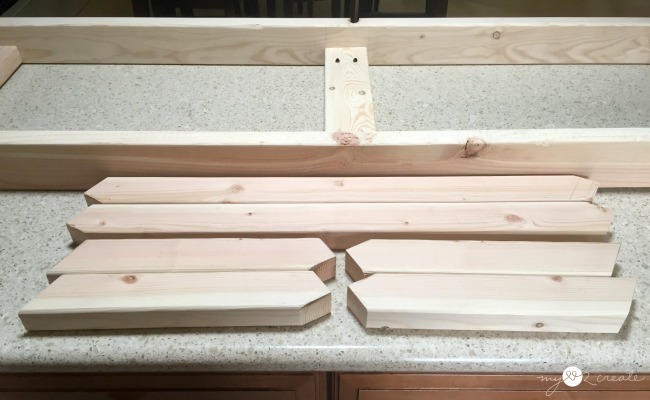 Once I had the sides ready to go I attached them together with the top support boards and the seat aprons. 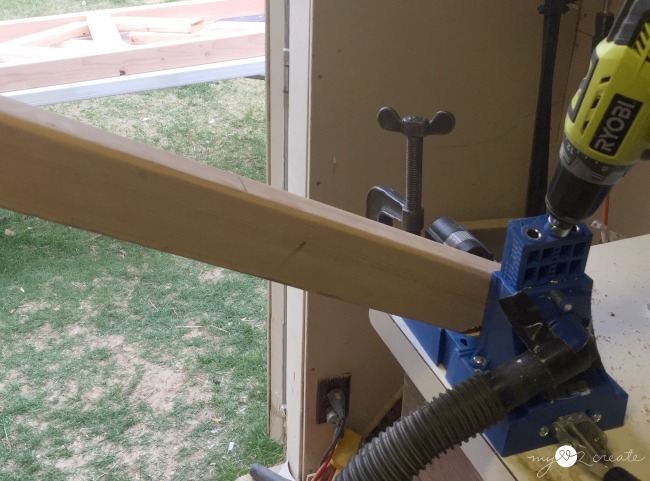 I added the seat supports and gave them a little love tap with my mallet to get them in. :) Then I drilled in the pocket hole screws. 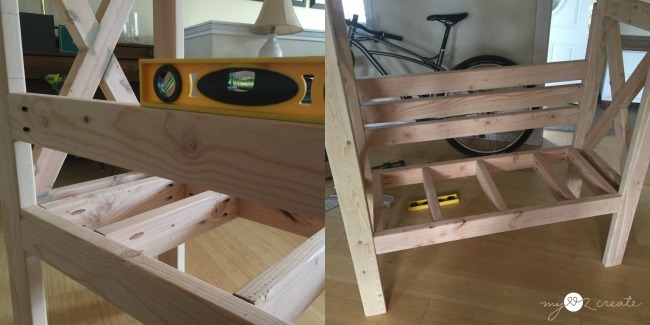 I added the seat backs with my pocket hole screws and made sure they were level. I actually decided to add these at the last minute, so they may not be the most comfortable because they are straight, but I am glad I added them anyway! 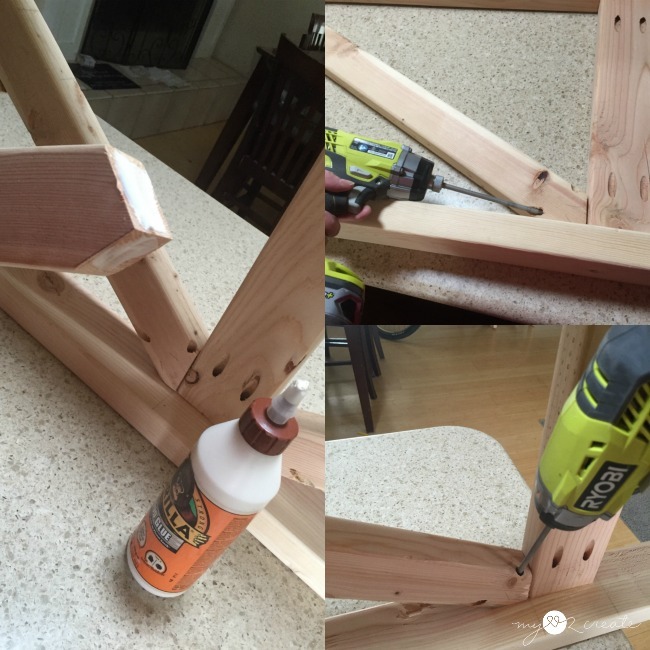 I used my clamps to help hold up my lower rafter (top left) and then used some 2'' nails to hold it in place. That way when I added my screws it was nice and secure. For the top rafters I marked 3'' from each and marked on the lower rafter where they needed to be placed. Then I clamped them and screwed them on. I mean how cute is this?! 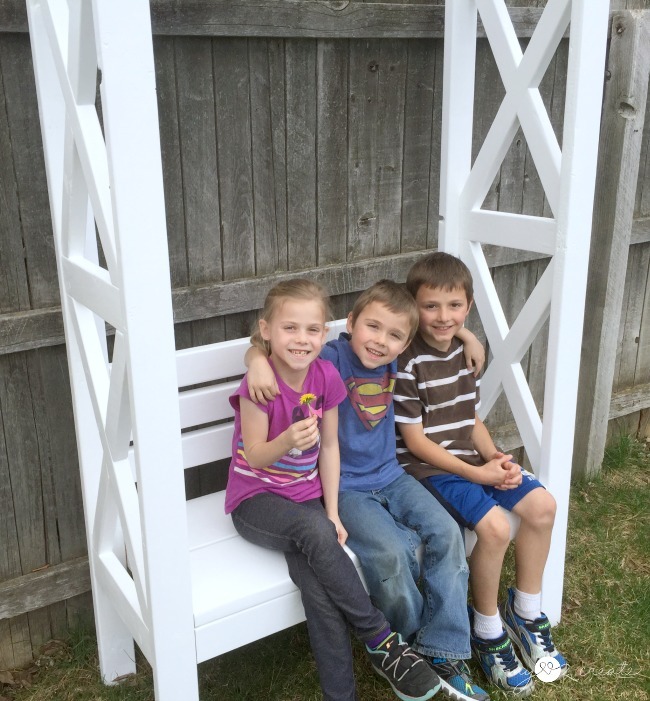 My three youngest, love them! So are you ready to build your own? Head on over to Build Something for the free plans! 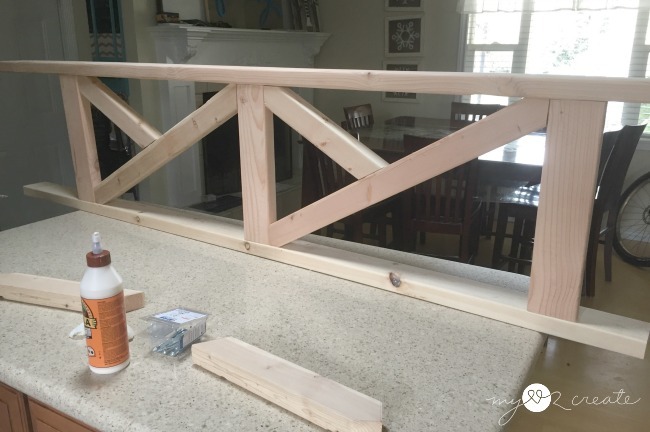 And if you build it, please tag me with #mylove2create on social media so I can feature you, I love to see your builds! That is wonderful, Mindy. It looks so good in white and with your adorable children on it! OOPs, typo... sorry Mindi with an "i"
Mindi, first I have to give you a thumbs up for seeing you built it in your kitchen (nothing stops a dedicated DIYer). 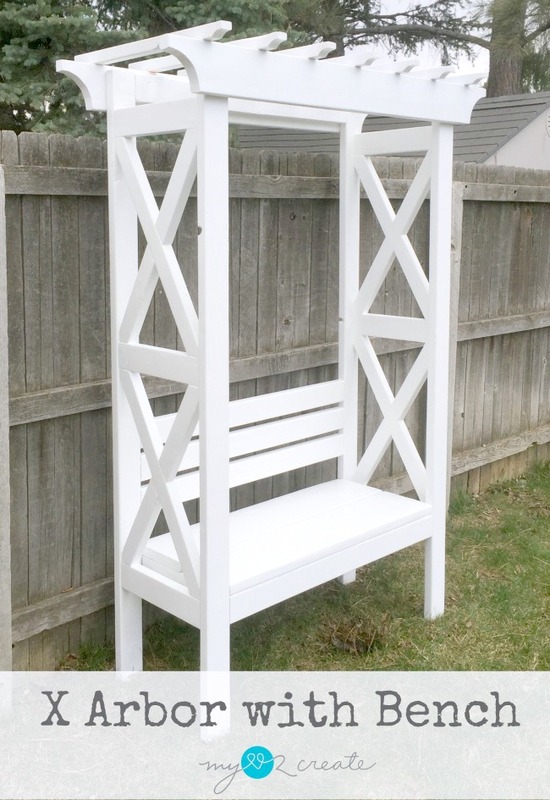 I love the design of this arbor bench and really love how it came alive painted white. 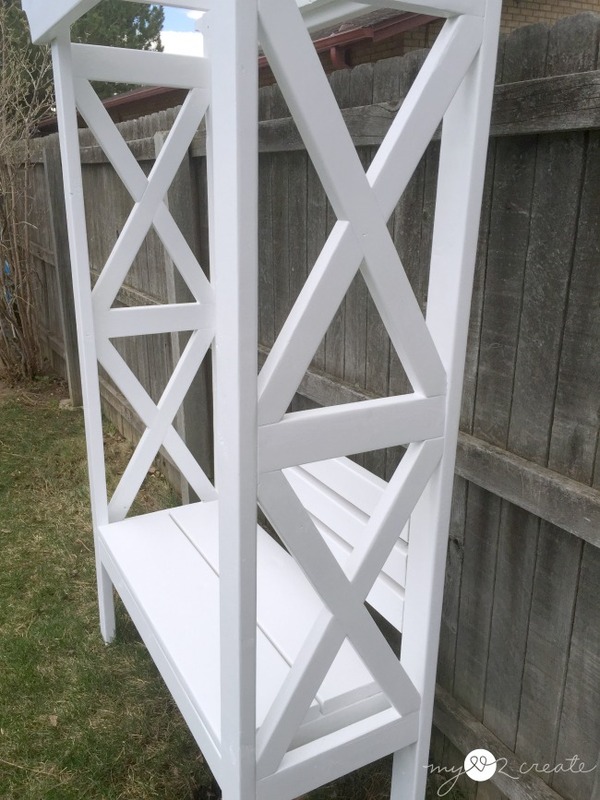 What would we do without our Homeright paint sprayers for projects like this, eh. Pinning to share! OMG you did build this in your kitchen! Thats awesome! 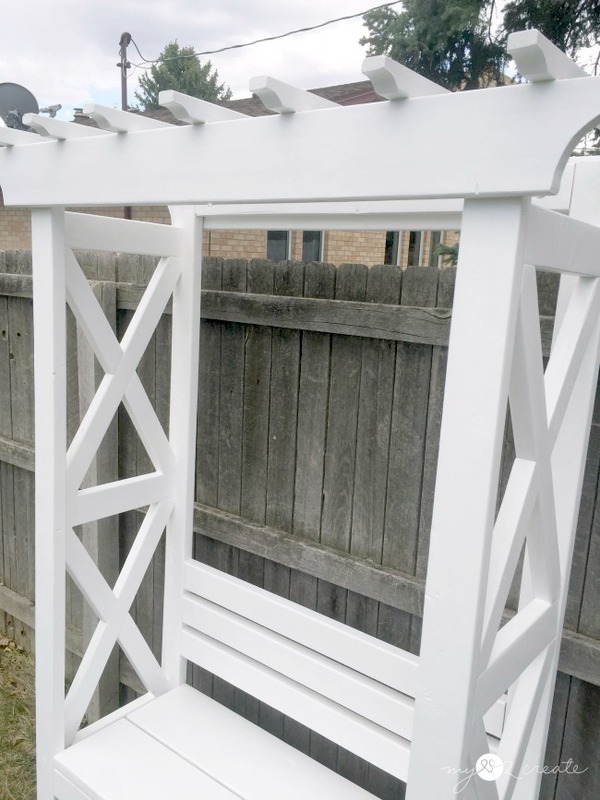 I'm very not at this level of crafting but someday I will be and I will have to attempt one of these for my backyard! Oh how I love your bench! I need to get me some powertools! 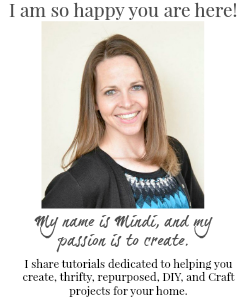 You never cease to amaze Mindi! 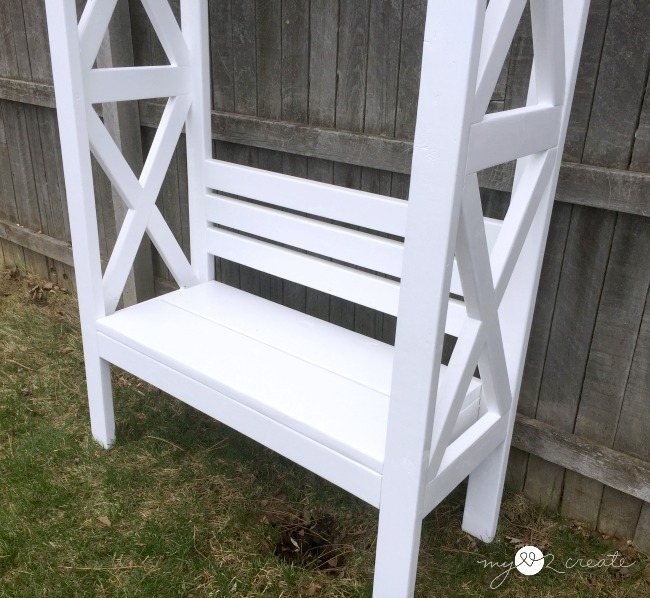 Thanks for sharing at Friday's Furniture Fix! Wow! Great job! 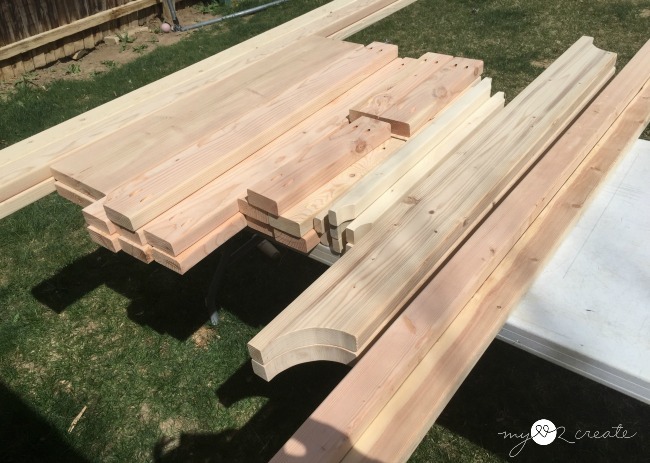 I was not expecting this post to include actual lumber--it looks far too polished for that. Way to go! Thanks for joining us on Idea Box Link Party! This post has made it into my features for the week. Hope you join us again this week!! Party is live tomorrow at 6am. 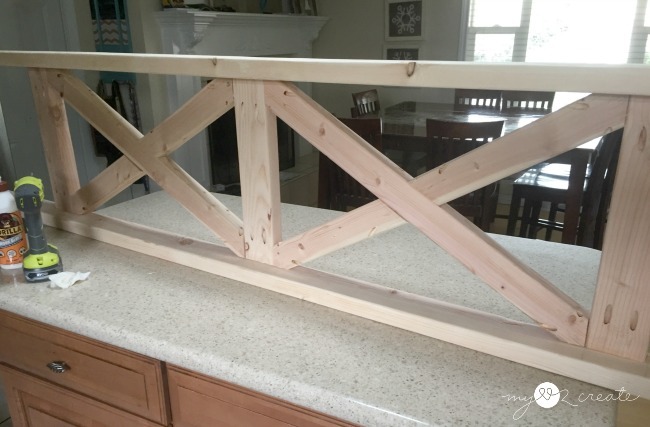 Pinning this one - great project with really good instructions! Thanks! It would be great if you would share it at the DIY party! That's amazing. 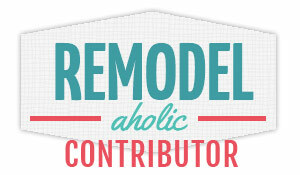 I pinned it since I am also in love with arbors. Hopefully one day "soon" I will be able to build one myself!